On Monday 30 November 2015, the Earth Watch Club held the second episode of Cafe Green. Professor of Sociology, Dr Julie Flowerday was the guest speaker and she talked about Progress vs Sustainability. Dr Flowerday is a socio-cultural anthropologist. She has professional experience working in the United Kingdom for 10 years. 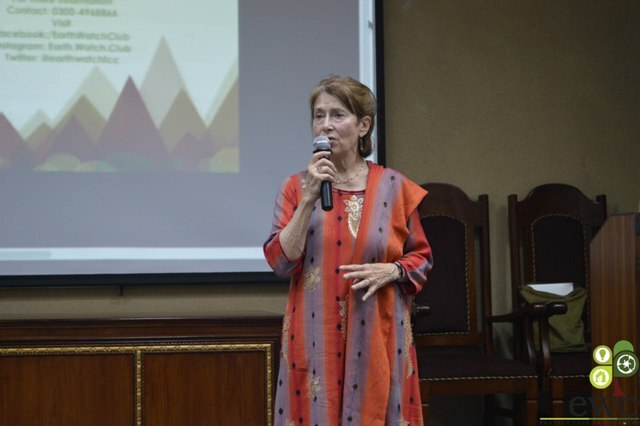 In 1995, she undertook her research in Gilgit Baltistan and was then a faculty member at the University of Gujrat. She has recently joined the Sociology department of Forman Christian College. The talk focused on how our physical and sociocultural environment has shaped civilizations. Dr Flowerday spoke about the example of how Norsemen; initially prevalent in Greenland around the 9th century suddenly disappeared at the end of the 14th century. She also spoke powerfully about the impacts to the environment that is both visible and invisible to use. Her use of the Hamburger as an illustration to explain was particularly enthralling. The Hamburger and fast food are amenities which are visible to us and represent modernity and progress i.e. Mcdonalds as a symbol of development. However the environmental impacts may be invisible to us such as the amount of cattle slaughtered, deforestation and other related practices required to sustain the simple Hamburger. Overall the session was well attended by many students from a variety of disciplines. Using the Green Café sessions as a platform; the Earth Watch Club endeavors to bridge the gap between various fields in order to create awareness and promote a sustainable future.